Alina Kunitsyna born 1981 in Minsk, Belarus, lives and works in Vienna and Damtschach. The title of the exhibition “In the Fold” refers on the one hand directly to the fold depicted as an object, which always had a strong presence as a subject of Kunitsyna’s works, and on the other to the representation of faith, love and peace, on the artist’s own subjective semantic level. Therefore, the presented paintings and sculptures actually constitute knowledge, solidified into a form by way of different techniques, and derived from philosophical thought in the fields of logic, ethics, and metaphysics. A highlight represents the painting “Dance of Gentleness“ that depicts three figures, covered in blue, who appear to float in space in circular motions, interacting nonverbally and without conflict—just gentle (see also Lucas Gehrmann’s essay in Kunitsyna’s new catalogue “In The Fold“). The painting, measuring 250 x 270 cm, is a milestone in the artist’s 15-year quest for an adequate pictorial expression of a subject or an event—in its absence. Kunitsyna’s works testify to consistent and intense observation and captivate by their formal precision. 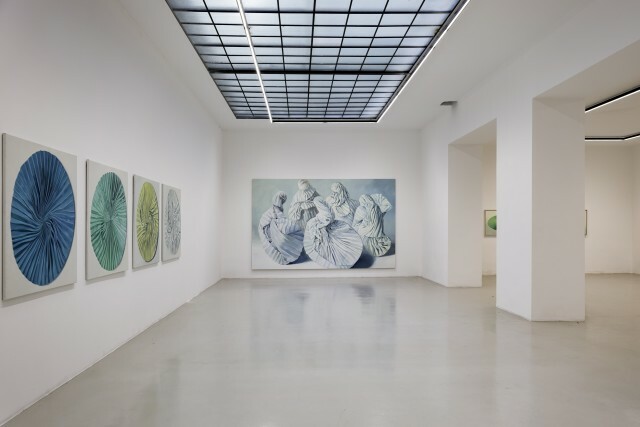 In her compositions, she creates tension between body and space, and here the deserted shells can be seen a metaphor for the membrane between the inside and the external. Alina Kunitsyna’s new catalogue „In The Fold“, recently published at the Verlag für moderne Kunst (VfmK), Vienna 2017, will be presented at the opening of the exhibition.